228 pages | 66 B/W Illus. Until the early 1990s, Japanese education was widely commended for achieving outstanding outcomes in global comparison. At the same time, it was frequently criticized for failing to cultivate 'individuality' and 'creativity' in students. Wide-ranging education reforms were enacted during the 1990s to remedy these perceived failings. However, as this book argues, the reforms produced a different outcome than intended, contributing to growing disparity in learning motivation and educational aspiration of students from different class backgrounds instead. 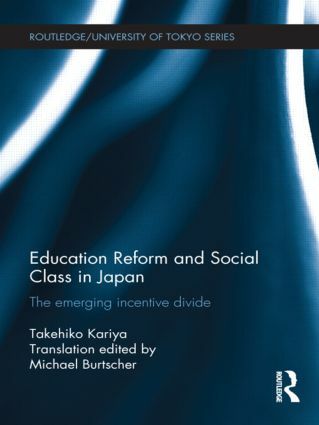 Takehiko Kariya demonstrates by way of empirical sociological analysis that educational inequality in Japan has been expanding, and that a new mechanism of educational selection has begun to operate, which he calls the 'incentive divide'. Casting light on recent changes in Japanese society to critically reassess educational policy choices, this book's quantitative and qualitative analyses of the 'mass education society' in post-war Japan offer important insights also for understanding similar problems faced in other parts of the world at present. Translated into English for the first time, the Japanese language version of Education Reform and Social Class in Japan won the first Osaragi Jirō Prize for Commentary sponsored by the Asahi shinbun. This book will be of interest to students and scholars in the fields of Asian studies, Japanese studies, education, sociology and social policy. Takehiko Kariya is Professor of the Sociology of Japanese Society at the Nissan Institute of Japanese Studies and the Department of Sociology, University of Oxford, UK.